The mission of the Aerospace Structures and Materials department is making load carrying structures of aircraft and spacecraft lighter, safer, cheaper and more environmentally friendly. The ASM department researches novel materials, new (hybrid) material combinations, new structural concepts plus combinations there of. To support these objectives, the required (numerical) tools and methods are developed. Traditionally the 3 sections within the ASM department focus on complementary aspects of the mission and via synergy achieve an optimal, efficient and societal relevant implementation of our mission. 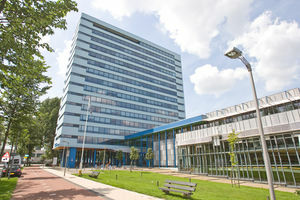 The Faculty of Aerospace Engineering has a highly advanced laboratory at it's disposal: the Delft Aerospace Structures & Materials Laboratory. We perform research in the field of aerospace structures and computational mechanics, and educate our students to be lifetime learners. The group focuses on research related to the manufacturing, maintenance, and repairment of aerospace structures. Our expertise: thermodynamic design of novel alloys, development high performance polymers for structural applications, self healing materials and smart materials. The group focuses on product and process innovation with advanced polymer composites. Its interdisciplinary research between materials science, engineering and manufacturing provides building blocks for novel industrial technologies.